In an attempt to be healthy, but also to try out my mini donut maker, I decided to attempt some recipes for baked donuts. 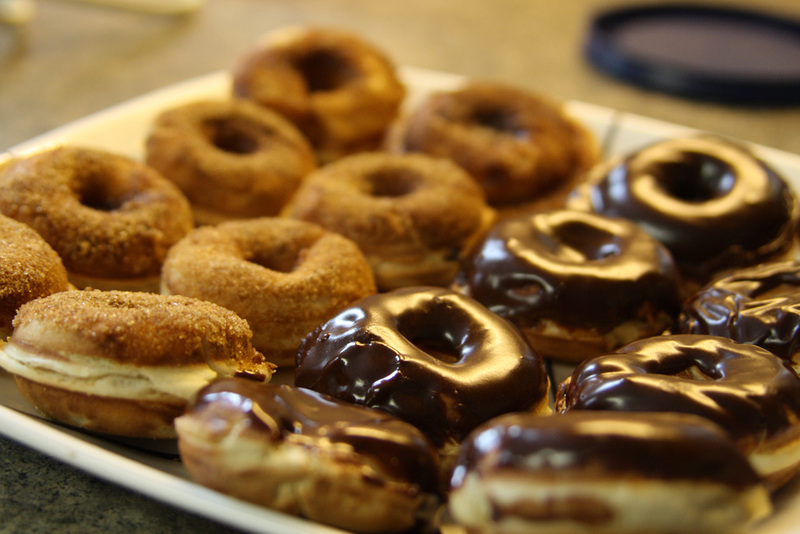 Read more about Baked raised donuts - not the same as fried, but good nonetheless! 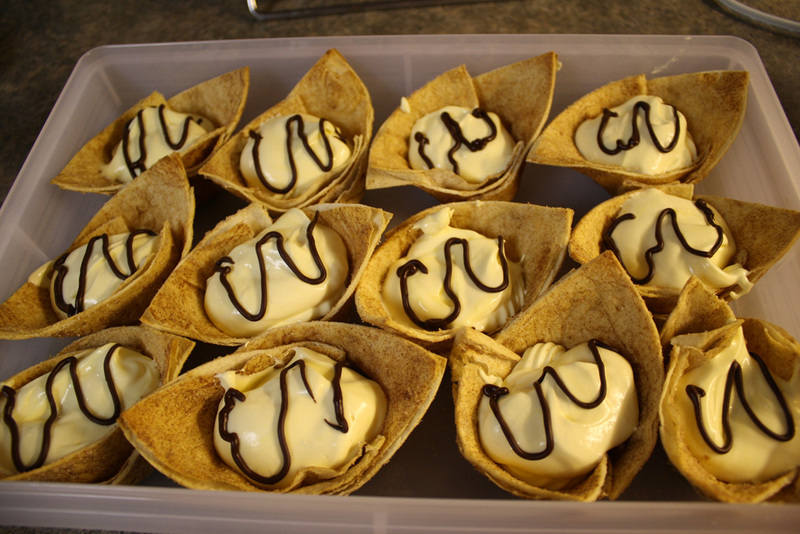 I was searching around the internet one day for tasty desserts to serve at a party I was hosting and came across this amazing recipe from Taste of Home called "Tortilla Dessert Cups." I made some minor modifications and came out with one of the best desserts I've ever had. It kept well for about a week in my refrigerator and was low in calories to boot! Finally, what would a night of appetizers be without a little dessert to finish it off? 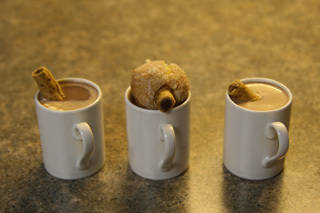 After polishing off the mini burgers, fries in a shot glass, and pigs in a blanket, it was time for a little dessert snack: hot chocolate and donuts! I am always trying out new recipes and experimenting with them until I've found something I really enjoy. Every once in a while, I even stumble across something particularly awesome. Our new favorite cake consists of Devil's food cake, caramel, hot fudge, toffee pieces, and homemade cream cheese frosting! 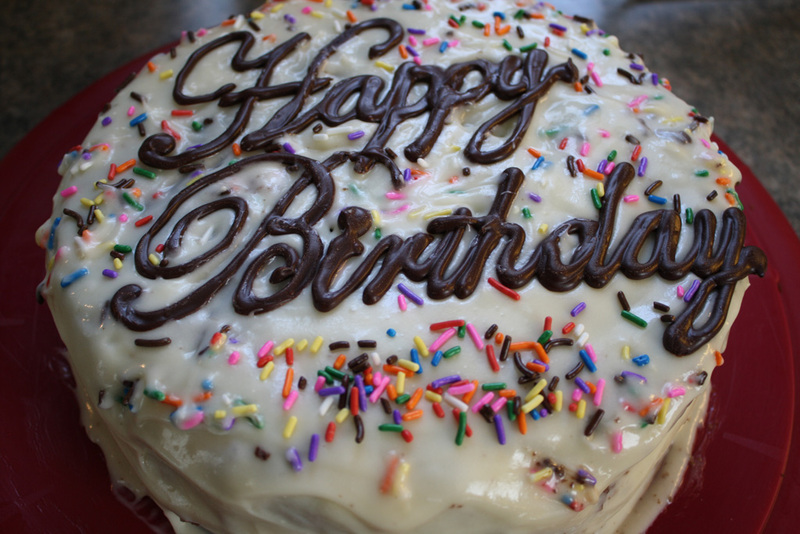 It is a delightfully decadent cake for all to enjoy! Delicious, Homemade Ice Cream Sandwiches! 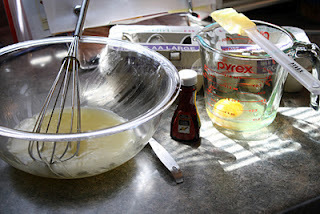 Read more about Delicious, Homemade Ice Cream Sandwiches! 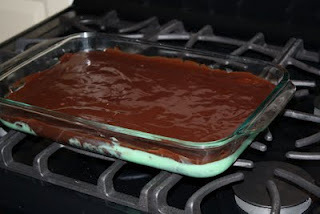 Grasshopper Brownies - with and without coconut! I was in Alaska last summer and visited a nice tourist town called Seward. While there, my sister and I wandered around and discovered this cute cafe/bakery place. I cannot for the life of me remember the name of the cafe, but I do remember that they had the most incredible brownies I've ever had. I tried looking up the cafe, but I wasn't able to find the name of these delectable brownies! Read more about Grasshopper Brownies - with and without coconut! This past January I married a wonderful young man whom shares my love of food. 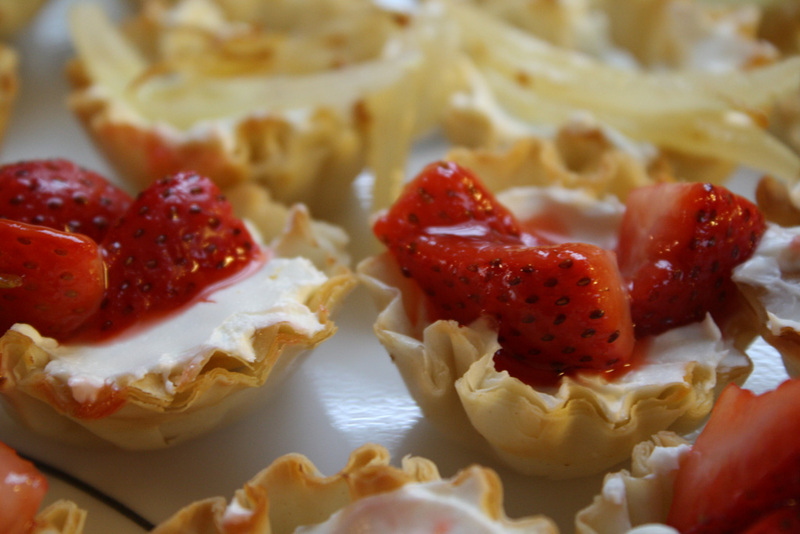 At the wedding, there were these delicious goat cheese tarts with carmelized onions. Unfortunately, because we had to be in the receiving line, we only got one of these tasty treats. Read more about Caramelized Onion Tarts! Warm, Fresh Baked Strawberry Pie! 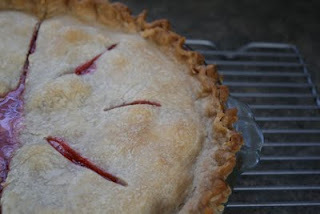 Usually when I bake a "strawberry" anything pie, it's a strawberry rhubarb. However, my friend was visiting from out of town and special requested a warm, strawberry pie with top and bottom crusts. I loosely based my recipe on a blueberry pie recipe that my grandma taught me. It worked out fabulously! One caution: warm strawberry pie does not have time to congeal properly, so it will leak delicious strawberry goo in the pan. No worries! Read more about Warm, Fresh Baked Strawberry Pie! Tuxedo Brownie Cups - Another innovative way to make your brownies more fun! My mom is a huge Pampered Chef fan and is always trying out their recipes. When she throws little get-togethers, I am fortunate enough to be invited and have the pleasure of taste-testing these delights. 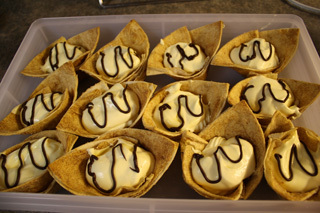 One of my absolute favorite recipes is called Tuxedo Cups. 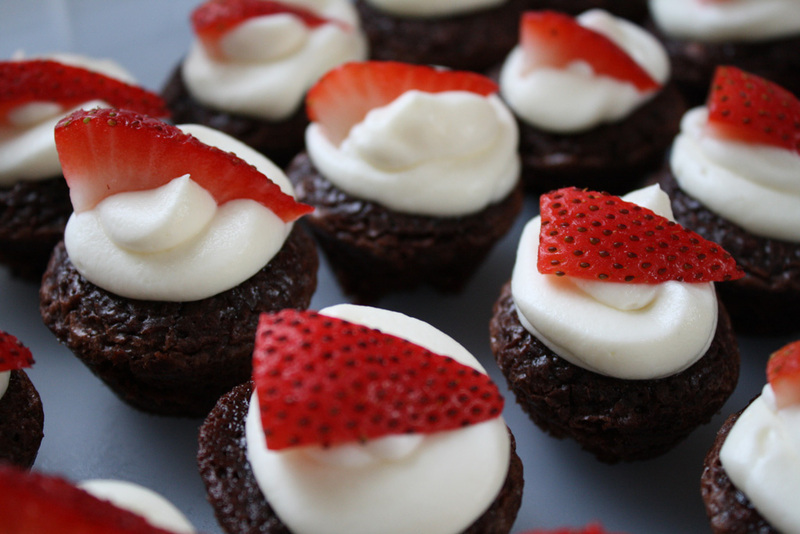 Read more about Tuxedo Brownie Cups - Another innovative way to make your brownies more fun! I have always had a bit of a sweet tooth and nothing gets me like a really good chocolate cake or chewy delicious brownies! 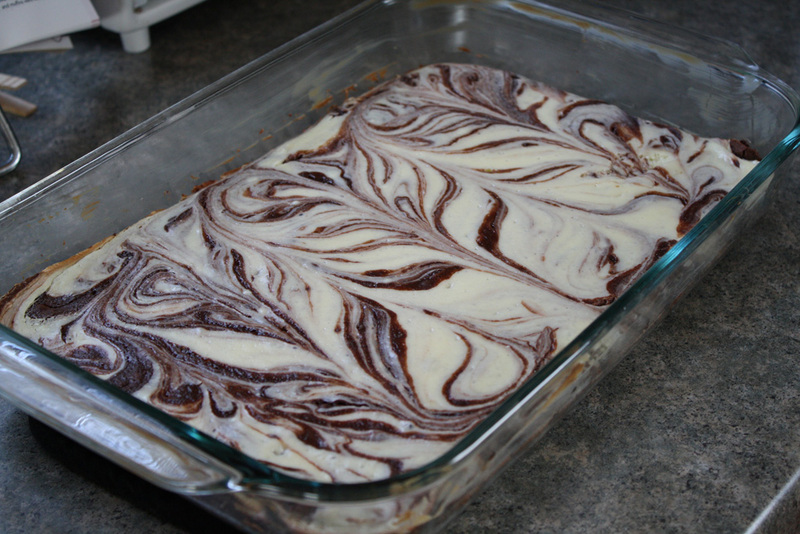 When my mom started making cheesecake brownies I thought I was in Heaven! They have all the delicious chewy-ness of regular brownies with the added bonus of a cheesecake-like layer. This fantastic dessert will leave your guests begging for the recipe.